Hi my name is Amber and I am a curry addict. No elaboration here, folks: I'm guessing VegKid and I consume a curry dish once a week on average. Seriously though, if you're going to be addicted to something why shouldn't it be something that can be so healthy and versatile with it's smooth, velvety, flavors? I'll take an addiction to the complex broth over anything else, any day. Anyway, it should come as no shock to y'all VegKid and I had curry last night for dinner. What might come as a surprise is we got to pull two cards last night from our dinner guest; a long time friend with a heart of gold. We pulled her CurryCard and her TofuCard. I guess you could say we pulled her VeganCard as well. I feel pretty sure that was her first vegan feast. 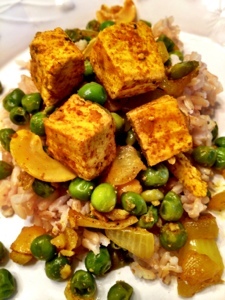 After she left VegKid looked at me with the most bizarre look on her face and asked, "What did she mean she has never had curry OR tofu before. That's insane!" One thing I like to do with my curry is think ahead to the rest of the week. I'm sure you've all had the Leftovers Effect happen a time or two. Don't know what I am talking about? The Leftovers Effect is when your leftovers taste better the next day. The flavors have time to snuggle up and become BFF so naturally the food tastes better. This is common in Asian dishes. So I will make some curry at the beginning of the week and sometime mid-week, viola! Curry amazing appears. I happened to make this curry the night before dinner was served and it was a huge hit with no leftovers...just how I like it. Heat oil in skillet with the spices FIRST. <--Important. Once hot and mixed, add tofu, saute it with the spices, and then add your onions. Stir often for about 5 minutes. Then add the peas and saute another 5 minutes. Add cashews last. Mix and remove from heat.